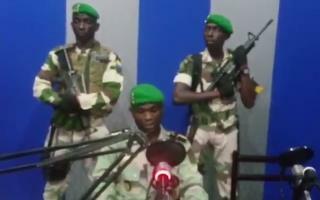 (Newser) – Soldiers from Gabon's Republican Guard have appeared on state television saying they have launched a coup "to restore democracy" in the West African country. Early Monday a soldier who identified himself as Lt. Obiang Ondo Kelly, commander of the Republican Guard, read out a statement saying the military has seized control of the government. He was flanked by two others holding weapons and all were dressed in camouflage uniforms and green berets, the AP reports. A curfew has been imposed over the capital, Libreville, and the internet has been cut. The city is being patrolled by military tanks and armed vehicles, but no violence has been reported. President Ali Bongo, in power since 2009, has been out of the country since October amid reports that he had a stroke. He recently addressed the country in a New Year's message that was filmed in Morocco, where he has been receiving medical treatment. In his brief New Year's speech, the 59-year-old Bongo declared that the country was "indivisible" and acknowledged his health problems without giving details. "A difficult period," he called it, and a challenge that he surmounted "thanks to God." i take it he's now in charge because he has more toilet paper. If Associated Propaganda saying it's a coup, than I'm glad. Also, those are really good looking uniforms. Hot damn. Lol.... Like an old USA playbook.. Take something by military force & justify by claiming to do it for DEMOCRACY! LMFAO!